There's nothing better than coming home to your own bedroom, whether after a long day or an entire semester. And as much as I've come to love the coziness of my little dorm room, it will never be able to compare to the comfort of my bedroom at home. Though my room's decor is constantly evolving, it hasn't truly been redone since I was in the sixth grade, back when I was sure I wanted to be an interior designer. My career aspirations have certainly changed since then, but I still have fun scouring home magazines, perusing interiors stores, and dreaming up designs of my own. So, as you might imagine, my roommate and I were all about planning every last inch of our tiny shared space, and I was absolutely ecstatic when my mom recently agreed that my bedroom could use a revival. In typical MK fashion, I immediately began creating my vision and compiling a Pinterest board to share it with my mom. I was envisioning a light, calming, feminine space to tone down the bright colors that currently occupy the room, and I think I've finally achieved that. My taste--both in home decor and clothing--is generally pretty matchy, hence the prominence of a few main colors. I began my search with the focal point of my room, the bed, opting for a white duvet as I always seem to do. The ruffles of the duvet and shams combined with the leather and fur of the throw pillows offer some textural interest while keeping colors pretty neutral. The throw blanket and rug tie the colors together, which makes me oh-so happy. And can you believe that it all works perfectly with the current paint color of the room? Total coincidence. The art prints are by my favorite local artist and express my dreams of traveling the world. 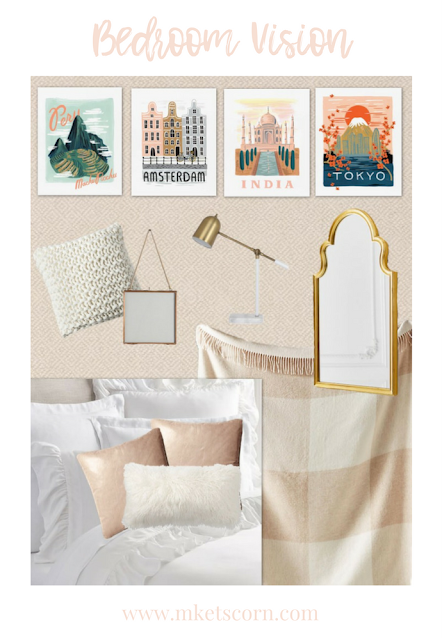 And, of course, it wouldn't be an MK room (or outfit) without just the right amount of gold accessories! I'll be sure to post an update once this room transformation is complete, but, with my indecisiveness, don't be surprised if it looks pretty different from my current plan!